RUSH: The Democrats are trying to connect Trump to the ongoing so-called failure of getting aid and relief to Puerto Rico. And that’s gonna bomb. You know, it’s starting to happen. Actually, I think it’s been happening for a while. The left does not innovate. The Democrat Party, let me specify it. The Democrat Party does not innovate. They don’t have any innovators, and they don’t have any forward thinkers. If the Democrat Party produced a smartphone, it would still be 30 years old. And the only thing that would change in it is the numbers of people that you can call. They really don’t innovate. The way they’re going after Trump on Puerto Rico is a replay of how they went after Bush on Katrina, which is a replay on how they went after George H. W. Bush on Kuwait, which is a replay on how they’ve gone after Reagan for not caring about — it’s just a replay. They just go to their playbook and repeat things that, in their minds, have worked very well, and they try to adapt them to the modern era, but it doesn’t work, and it’s all falling apart. Drew Brees, New Orleans Saints, came out and said, “We’re gonna do both. We’re gonna kneel and then we’re gonna stand.” That I predict is not — like I said last night, the NFL is making a tactical error here and maybe even strategic. And I think corporate America has been doing the same thing. Corporate America — the NFL’s in that world — gets caught up in media and they see everything through the lens of media, as the most people do. But the picture of America that the media paints or broadcasts or portrays isn’t accurate. And let me give you an example. I hearken back to this all the time, because, to me, it’s one of the best. Mike Pence was governor of Indiana. And they passed a religious freedom restoration bill because in Indiana people were being prevented, they were being protested, they were having trouble expressing religious freedom, which is granted in the First Amendment in the U.S. Constitution. So what Governor Pence and the Indiana legislature did was pass a state law that basically reaffirmed it. They found it necessary to do so because not enough people knew that religious freedom was guaranteed in the First Amendment of the Constitution. It cannot be abridged. But there were ongoing protests and other hassles that were being visited upon Christians in Indiana. So they come up with a religious restoration bill. Well, immediately the media tried to portray the state of Indiana as homophobic and racist and bigoted. And you remember, the media went all over the state knocking on doors of businesses. They were trying to find a business that would admit that it would not cater a gay wedding, if it was a pizzeria, if it was a bakery, if it was a photography studio. It took them two weeks, and they found a little pizzeria in a small town in Indiana, and the daughter of the owner was 21 or 22, and they run into her shop with their cameras and microphones and ask her, “If a gay wedding asked you to cater their reception, would you do it?” And she said, “No. It’s a violation of my religious beliefs,” and they were off and running. So they found one example. The coverage of the whole incident in Indiana was made to look like Indiana was an outlier, that the rest of America sees Indiana the way the media was portraying Indiana — as backwards, as Christian, as restrictionist, as exclusionary, as racist, as bigoted, as homophobic. So now if you happen to be a corporate CEO — a titan of industry living in Montana, living in Arizona, living in Texas — you watch this, and you might be forgiven if you believe that the media portrayal, the narrative here is right. In other words, I think that a number of people and institutions — corporate leaders — have mistakenly bought the media narrative of where American culture is, and they believe that American culture is moving left — and it is in certain spots. I’m not denying that. They believe that American culture all is united against Christian conservatives. In other words, the people the media portray as enemies is made to look like everybody in America thinks so. And you can see when you look at corporate marketing how they choose to advertise and sell their products. You can tell who they think their audiences are, and I believe in many cases they’re missing the mark. And I think the NFL is one of these corporate entities that’s missing its mark. 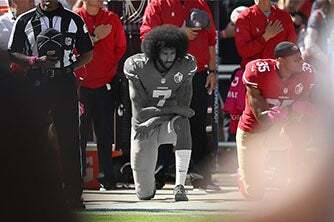 I think there are people there who really believe that sideline protests of the flag and disrespect for the flag and the honoring of Colin Kaepernick was going to improve their image. Why would they do it otherwise? Why would the NFL purposely engage in activity if they knew it was going to be harmful? Now, wait. There are institutions that are doing that. ESPN is continuing to lose subscribers, and yet they are continuing to take action and implement policies that will guarantee the continued erosion of subscribers. While saying they’re not a political organization, they’ve gone all left, all the time. Do they know that they are offending a great majority of their audience? Do they not see the cancellations of subscriptions to cable TV and online? What if they do? What explains why they continue to do this? Well, what explains CNN continuing to do what they do when they stay in tenth place? Why? Why doesn’t CNN adapt? Why does CNN…? Well, part of it is niche advertising and pursuing a niche audience and trying to own all of it, but another aspect of it is — I guarantee you — that CNN believes it’s hip. CNN believes it is where the majority of thinking is; it’s just taking a while for people to admit it, and CNN’s gonna be loyal to the cause no matter what. They’ll go down with the ship. They’ll go down with the flag. If liberalism kills CNN, if CNN dies as a network, they’ll go down on the ship with it, because they’re loyal to the cause. Is that the NFL? Is the NFL so devoted to a political ideology that they willingly allow the product to suffer just to stay loyal to the political ideology? I don’t think so. We’re already seeing the league try to backtrack. They had a big meeting yesterday, and do you know the thing that came out of that meeting? There were owners in the meeting. There were players in the meeting and NFL execs, the commissioner. You know what the big thing to come out of the meeting was? Have you heard? The big thing to come out of the meeting was they all agreed that this approach — that it’s the players and the NFL versus President Trump — has got to stop. Why? Because they’re losing it. They didn’t think they were gonna lose this. When owners and management promote — and that’s what they were doing. That’s why I was sad. That’s why I was despondent on Sunday and Monday. When the owners, when the league officials — the commissioner, his executive team — tout this public display of anti-American symbolism — which they did. They all lined up with the players, and they all touted what the players were doing, and they all said it was about “unity,” when it’s not. It’s about division. They lined up against their customers and with their employees, and I contend to you they did so for a number of reasons. A, they rolled the dice. They’d much rather lose the fans (what they think is temporary) than have the players walk out. So the owners, they were scared. They had to side with the players on this. The league did, too. But in the process, they went the wrong way. They went down the wrong path, and all the polling data shows it. You can see now by the league trying to backtrack and all these teams announce there will be no sitting; we’re gonna stand. Not all of them, but those who are are making a big deal of it. Now, the point in all of this is that I think a vastly incorrect picture of America is portrayed and painted by the media each and every day, and unwitting people (who otherwise are smart and intelligent in their own right) believe it, and it makes them make incorrect decisions. Climate change is another example of this. Climate change is not happening. But if corporate America thinks that a significant percentage of America believes it’s happening, they’ll market to it. They’ll do whatever they can to separate people from their dollars. But it isn’t working. A majority of Americans do not believe America is destroying the planet, because in every one of these left-wing issues, guess who the culprit is? America. America’s racist. America’s unjust. America’s destroying the planet. America is creating havoc around the world. America is this and that. America’s wrong. America’s evil. America’s mistaken. People have had it; they’re fed up with it. Because a majority of Americans don’t believe that, will not believe that, and don’t want to be made to believe it. And so they’re reacting now in numbers that look like they’re a surprise, because the media has made people believe that that is a very small percentage of our country, when what we’re learning is that it is a majority. So it’s all good in this sense, but I’m still amazed at how easy it has been for people to make these powerful entities misjudge. Now, folks, look, it could well be, too, in some of these examples that the CEOs and the boards of directors are full-fledged libs, and they’re gonna be loyal to that no matter what and they’re gonna take it as far as they can until economics dictates they back off of it. I mean, there’s also that possibility too. Bottom line: The country is not what the media portrays it to be. The country and its cultural values have not yet been erased and destroyed. The founding ideals — the founding principles, the traditions and institutions — are not yet the minority of thinking in this country. And yet so many entities seem to think that progressivism has become the majority of thinking and acting and behavior in the country, when it isn’t, largely because the media makes it look as though that’s hip and that’s cool and traditional American values are uncool and unhip and nerdy and what have you. 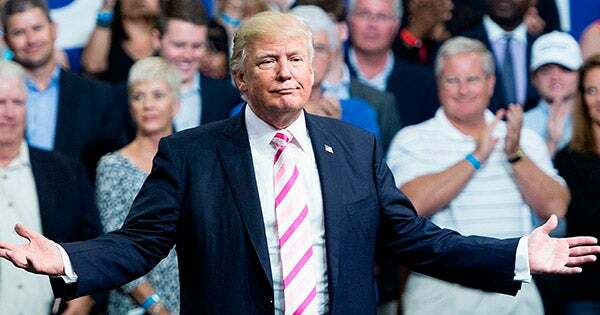 RUSH: Morning Consult with polling data on the National Football League. This is a major drop, by the way, in seven days. On September 21st, 25% of Trump supporters said they had a very favorable view of the NFL; 11% had a very unfavorable view. So September 21st, basically eight days ago, 25% Trump supporters favorable NFL, 11% unfavorable. Yesterday, the numbers have dramatically changed. Thirty-three percent of Trump supporters now say unfavorable view of the NFL, 16% favorable. So the favorable has fallen nine points, and the unfavorable has gone from 11 to 33% in just a week. What’s happened in that week? The NFL has appeared on television and in the media to be defiant of the concerns of their fan base. They’ve been very vocal. They have been very defiant. They have continued to talk about their unity, which isn’t unity; it’s division. And I think they probably would be shocked, maybe not now, because I think the NFL is starting to exhibit signs that they understand it. But in their view they’ve got a real balancing act because these players are off now on this. I mean, they’re into it. And the league is between a rock and a hard place. They can’t just replace. I mean, in some cases players are a dime a dozen, but star power isn’t. So we’ll see how this manifests itself. Here’s a story that dovetails precisely with my observation that the Democrat Party and the left really are having trouble innovating. Don’t misunderstand me, by the way, folks. I’m not saying that they’re wilting away, fading away. They are still a powerful force led by the media, and they still have the ability to entirely misrepresent anything they want and have a lot of people believe it. Don’t misunderstand. I’m talking about opportunity here. You know me; I’m always looking at opportunity. I’m always looking at things optimistically. Like I do hope that this NFL stuff can be erased. It may be the first time in any issue that we’ll be able to totally erase — if the NFL hopes to become what it was — and who knows, maybe they don’t. Maybe they’re run by a bunch of people that themselves are social justice warriors. I don’t know. Frankly, I have been stunned at how the NFL has chosen to respond to this concussion business. I have been shocked at how they’ve chosen to respond to that. I mean, we’re watching a concerted effort to destroy this game take place, and the people running it seem to be strategically thinking they have to cooperate with it, and by virtue of that, they acknowledge some of the allegations and then claim they want to work with those attacking them. It never works out that way. You give an inch to the people that want a pound of flesh, they’re gonna keep asking, taking, demanding. I’m stunned at this. I really am. I used to think that these people in these leadership positions were brighter than everybody else. I admittedly was younger and more naive. I used to think these people were really smart, that they were there because they were smarter than average and they were in these positions of power because they knew how to protect and grow their enterprises. But as more and more people have come under the — I call it the spell — the education of liberalism and the corrupting effect and impact that it has, I sometimes wonder, are there any adults left? Are there any mature adults with the confidence to reject that which seeks to destroy who they are? Big Oil as gone through it. Big Pharma has gone through it. Every big corporate concern is under constant attack and has been. And watching them navigate it has been fascinating. Some of them have failed big time. And the NFL is one of these things that I hope gets its act together at some point. RUSH: Luke in Charlotte, North Carolina. Luke, great to have you on the EIB Network. How are you? CALLER: Hey, Rush, dittos. The reason I called you is last night was a terrible night. I sat there and I did not turn on — for the first time in 60 years of my fandom — the Bears-Packers game, and I used to play for the Little Bears in Chicago. I actually played at halftime during the Bears game at Wrigley Field. That’s how old I am. I got to shake Papa Halas’ hand, and I’ve been a die-hard Bears fan. If they’re losing people like me that are so upset, so angry, so frustrated, then I can’t imagine how many people are tuning out. RUSH: Why…? Look, the answer may be obvious; I just want to hear you say it. Why’d you not watch? CALLER: It just… You know, I’m a veteran, okay? That’s one thing. I’ve devoted my life to service in one way or the other, and to the country — and to see that disrespect. And this holding-arms thing? I was telling Bo, this holding-arms thing is not a compromise. That’s an act of defiance. CALLER: — you stand at attention, you place your hand over your heart and you show respect. CALLER: Locking arms as an act of defiance. RUSH: That is exactly right. This linking arms thing, it did not work in Green Bay. The fans were shouting, “U! S! A! U! S! A!” They did not link arms. Their star quarterback, Aaron Rodgers, asks the players, asks the fans to join the players and link arms. That’s not how you honor the national anthem and the flag. That’s not how you do it. The league… (sigh) Folks, the NFL is 75% African-American. The players in the NFL, by any objective comparison, are wealthy. They are stars, they are celebrities, and many of them are hero-worshiped. Many of these players are popular beyond their wildest dreams, respected beyond their wildest dreams. There is no oppression in the NFL. There is no racism in the NFL. It’s quite the opposite. So overt, in-your-face America bashing in front of America-loving, big-spending customers isn’t sustainable. The league simply cannot sustain itself if its players are going to engage in this kind of behavior. Because they… I don’t care what they say. By doing all of this on the stage… The playing field is a stage. It is owned by the owners. In some cases, there’s public financing of stadiums, but you get my drift. If they’re gonna take the stage and engage in activity that makes it look like they have grievances, what are people gonna think their grievances are? They’re gonna think the grievances are the league. Why are they doing this? Why are they doing this to the NFL? Why are they messing with this stuff on the sideline at NFL games? People don’t know Kaepernick. I mean, they do, but they’re not gonna sit there and put it together the players are in solidarity with Kaepernick. And, by the way, the players are now all backing off. “It’s not about the flag. We’re not protesting the flag. We’re not.” Well, then what are you protesting? It doesn’t matter what you say; we know that you align with Kaepernick, and we know what Kaepernick said. Kaepernick specifically said he was protesting the flag. He cannot honor a country and its flag that treats people of color this way. There’s all so much revisionist history going on here. But just the picture of these players acting as aggrieved victims or malcontents, it doesn’t fly, because nobody has ever said the NFL discriminates against them. Nobody has ever said the NFL is a racist organization that needs to be changed. Nobody has ever said this, and yet that’s where these protests are taking place. So the protests are actually harming the NFL, and it is my contention that that is the objective. People on the left — nameless, faceless people — have a desire to inflict great harm on the NFL for reasons I’ve detailed before. The players, I believe, are unwittingly… Some of them know what they’re doing, of course; there are exceptions to everything. But the players are unwittingly being duped into this thinking that they’re engaged in activity promoting solidarity and unity and diversity. And that’s not how people are seeing this at all, and it’s patently obvious now. This isn’t sustainable. Overt, in-your-face bashing of America in front of big-spending customers? It isn’t gonna work. You can’t sustain this. RUSH: Colin Kaepernick said he was protesting the flag and the anthem. He specifically cited them. Now a bunch of people are saying, “We’re not about the flag. We’re not protesting the flag!” Then what are you protesting? ‘Cause I’m telling you guys, it looks like you’re protesting the NFL and it looks like you’re protesting America, and people don’t understand it, and they’re reacting unfavorably to it. RUSH: So CNN’s running a poll that they say says that most people think Trump is wrong to criticize NFL players. Then why are NFL ratings down? They’re down again last night. Now, they had a rain delay last, thunderstorm delay in Green Bay. The numbers are down like 11%. That may be the wrong number. I just glanced at ’em. But the Thursday night numbers are down a year ago, same game a year ago. If CNN thinks that most Americans think Trump is wrong to criticize players, then why is any of this happening? Why are advertisers backing out and why are people not watching, and why is attendance down? RUSH: Here is Joanne is Deposit, New York. Welcome. Great to have you here. Open Line Friday. CALLER: Great job last night. RUSH: Well, thank you. Thank you. I appreciate that. Thank you very much. CALLER: You’re welcome. I enjoy watching you on TV. Love it. RUSH: You know what somebody said to me today, Joanne? CALLER: I like talking about you. I like listening to what you have to say, even if it’s about yourself. RUSH: It was the chef today. It was the chef. “You know what’s great, is watching you think out loud. People don’t get to watch you think on radio, but you’re obviously –” and then somebody else said, “You don’t even pause for a second to think about what you’re gonna say. You already know. You just launch with it.” And of course these are things I don’t even think about. CALLER: It’s that great mind of yours. That’s what it is. RUSH: Yeah, I guess so. CALLER: I wish I had half your brain. Well, I have a question about the NFL. CALLER: I know nothing about football. I probably know less than nothing, but from a business point of view, I’m looking at this, and I’m saying, “Aren’t these owners being bullied by their employees?” Because at my work, there’s no way I’m gonna tell my boss what I’m gonna do and what not to do. I’m expected to do a job, and if I have to sign a contract, I know ahead of time what’s expected of me. These are adult men that have watched football since they were little boys. RUSH: Many of them have an eighth grade education, though. RUSH: Let me explain this to you. This is actually, Joanne, a great, great question. You know, this is a great perspective. Somebody that doesn’t know the game, doesn’t watch the game, admits that she knows less than nothing about it, and so her question is pure. Her question is, “Why are the bosses letting the employees do this to the product?” Exactly! I addressed it, Joanne. The answer is the owners are scared to death. They have two choices: Side with the employees who are doing what they’re doing and then maybe even look like they support it. Or side with the customers, the fans. If they side with the players as they’re doing, what’s happening? Fans are watching less, attendance is down, the image of the game is taking a huge hit. The owners make a calculation. If they side with the fans then that is going to infuriate the players as a sign of lack of support. They’re gonna say this confirms what we’re saying that we do not have equality and that we’re not treated fairly. And if the players decide not to show up, then there’s no game. If the fans don’t show up, the game’s still played, and it’s still on TV, but if the players don’t show, and if they keep on not showing. So the owners make this calculation. They’re in, to a certain extent, a no-win situation. I think in most of these owners’ cases, they can’t afford not to express solidarity. That’s why more owners than you’ve ever seen are on the field during the pregame kneeling, linking. I have often believed — no, I should not say this. It’s perfectly totally true, but it’s so distracting, it might get me into trouble. But let’s put it this way. When 75% of your employees are of a particular race, and that particular race is expressing grievances all over our country with things that are unjust and unfair. If 75% of your employees are joining that way of thinking and you want to keep your team together — and you want the players to think that management has their players’ backs — you have to join them. That’s their thinking. You have to join ’em, whether they agree with it or not. Now, not all owners did. Not all owners issued a statement. Not all owners reacted to Trump. There’s a whole five or six of ’em who didn’t. And the media jumped right on ’em and asked why and started speculating, “They must be Trump supporters!” They were in the crosshairs. The media tried to do ’em great damage for not joining their players in this display of whatever it is. But the bottom line here is that the league is being harmed, and it is my contention that there are those who seek that very thing. I’ve chronicled it since the first time I noticed, two or three years ago, when I detected the media was spending more time pointing out the flaws and the problems with the league than they were reporting on the actual games and the exploits of the athletes who play it. I issued a warning at that time that the very media covering this game — i.e., promoting it, creating interest about it — is helping harm it. That has only continued with the making of movies. How about the news that a hundred out of 111 players in a random survey have irreversible brain damage because they played football? What you gonna…? I mean, they’ve created an aura, even among people watching the game, of nervousness and anxiety and it’s just not same. It just isn’t. This has all been manufactured and created because liberalism has found its way into the game. The tentacles are deep and they’re tangled, and its web is now interwoven deeply into the NFL. Whether you know it or not, that’s what you’re doing. If you’re supporting Kaepernick, that’s what he was doing. It’s a sad, sad situation. But this is not unique, Joanne. It is rare in professional sports that owners actually punish players for things like this. They side with players. The owners can’t do without them. Even though they’re a dime a dozen, it’s a unique situation here. If the players sit down, it doesn’t matter whether people show up or not. And if the players sit down, even more fans are not gonna show when they come back, especially about this. I appreciate the call. RUSH: Let’s try Ed in Grand Rapids, Michigan. Ed, I’m glad you called. How you doing? CALLER: I’m doing fantastic, Rush. How are you? RUSH: Fine, dandy. Thank you, sir. CALLER: You know, I find it very interesting that our unbiased media is so focused this week on something the president said about some football players, and yet we hear virtually nothing about a mass shooting at a church. You think it’s because the facts of this particular shooting — including the hero — don’t fit their narrative? RUSH: Very likely. I think it’s much the same as the president talks about players in the NFL, and the media says, “How dare you! How dare you!” Meanwhile, thousands — over the course of a year — are dying in Chicago, and the media won’t talk a syllable about it because it’s race-on-race crime, and they won’t talk about it. It doesn’t further their agenda. CALLER: Wouldn’t it be a good opportunity to them to talk about this so-called gun control they’re worried about? RUSH: Well, they have to weigh everything here, and they’ve decided there’s no future in using any aspect of that issue. Let me ask you this, folks. Let me try something else on this. I promise we’re getting near the end of this. I don’t want to end up frustrating people that the NFL’s a big topic here, but I do love it, and I’m devastated by what is happening here. Let me ask this. What if everything’s the same except instead of Colin it is a white player who refuses to support the anthem because he disagrees with American foreign policy? What do you think would happen to that player? Would the league and would other players join that player and would a cause have been created, and would the owners act afraid of it, and would the commissioner tolerate it? If during player introductions — this is my favorite one — they introduced the players and they run on the field… Many teams now don’t like individual units introductions, the offense running on as they’re named within the whole teams comes out. What if a player came out waving the Confederate flag? Oh, it’s freedom of speech. Diversity, fairness, equality! What do you think would happen? Hmm?